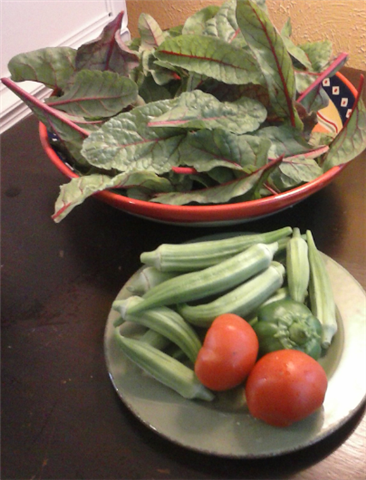 SUNDAY MORNING HARVEST FROM URBAN GARDEN 1 - Enough for two meals. Urban Garden 1 is the garden in my front yard that I'm currently converting from a lawn to a space that will eventually grow only edible perennials. For this year and the next, as I establish the perennials, I'll allow a few annual edibles in this area. Tomatoes, Okra, Bell Peppers, cantaloupe and beans are growing in this garden along side the developing shrubs, trees and perennials. 2. Chopped tomato and green bell pepper are placed on top of that layer. 3. Sauteed (in one teaspoon olive oil) sliced okra and onions poured hot over the greens. NOTE: When, for dessert, I add a bowl with 8 ounces of non-fat greek yogurt and a few strawberries (from my garden)--I have a meal that supplies me with 100% of my daily requirements for vitamin C and about 50% of my daily requirements for many other essential vitamins and minerals. In addition, I have met my daily requirement for 58% of required protein. I know that none of the vegatables I'm eating have been doused with chemicals and the only transportation requirements to get them to market (my dining table) are me and a wicker basket. I estimate that I have reduced by food footprint by at least 50%. Garland Market Place Today August 17-- Hurry! They are open until 2pm. The Garland Marketplace, located on the downtown Garland square, is held the third Saturday of the month from July through September. This is a new venture and, depending upon the participation and support from local citizens, it will either grow into a regular once a week event in 2014 or fizzle out. The plants you see in the photo above in front of Zach are small "Moringa Oleifera” trees. The Moringa is considered one of the world’s most useful trees. Every part of the Moringa Oleifera tree–from the roots to the leaves has beneficial properties that can serve humanity. In many countries Morgina Olefera is used as a micronutrient powder to treat diseases. The Moringa is a shrub or tree that can reach 36 feet in height at maturity and can live for up to 20 years. Like bamboo and hemp, Moringa is among the fast-growing trees as it can reach 9 feet in just 10 months. The Moringa has deep roots and can survive drought conditions well. And, according to the literature, Moringa can rebuild weak bones, enrich anemic blood and enable a malnourish mother to nurse her starving baby. It’s full of nutrients. A dash of Moringa is staid to make dirty water drinkable. In West Africa doctors use it to treat diabetes and in India they use it to treat high blood pressure. It can staunch an infection and makes an efficient fuel, fertilizer and livestock feed. I purchased one of these plants last month from Zach, and I'm happy to report that it's still alive and has grown about five inches. 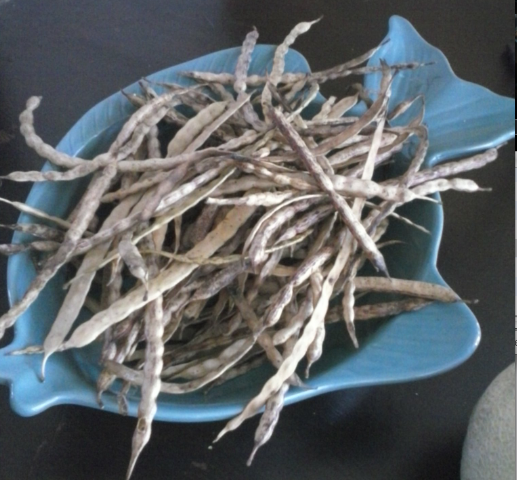 Mesquite Beans - I purchased a pound of mesquite beans this morning. My father and grandfather--both of whom were wheat and cotton farmers in west Texas would be shocked and amazed to learn that I would pay $5 for a pound of mesquite beans. Turns out that people can make some money from mesquite beans. If you don't believe me, go look on the Internet. Mesquite flour sells for as much as $13.95 for 8 ounces. Mesquite flour is said to not only be delicious but rich in soluable fibers, calcium, magnesium and it is gluten-free. Mesquite pod flour, according to the literature, has a sweet, earthy taste with notes of cinnamon, molasses, and caramel. Mesquite flour is a great for a wide array of cooking and baking, and can be a valuable component of a gluten-free or diabetic diet. You can use Mesquite beans to make a wide array of edibles--from chocolate chip cookies to wine. Here is a good source for Mesquite bean recipes. Lou Quallenberg Studios. 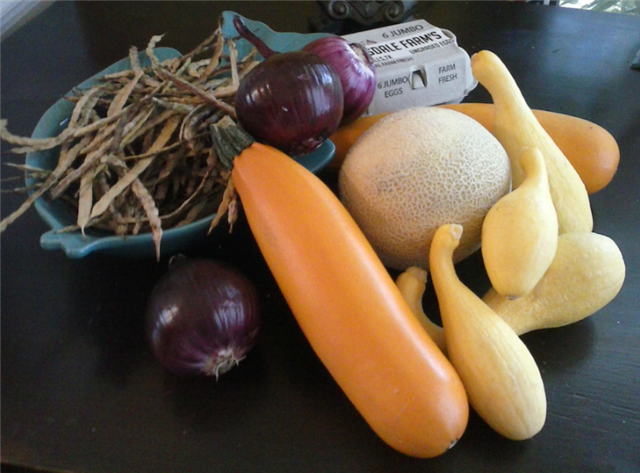 Golden Zucchini, yellow squash, red onions and cantaloupe were all purchased from the Esperanza Farms booth. I've never eaten golden zucchini but I'll let you know what I think of it after I do. The woman from Esperanca Farms assured me that it was sweeter and better than the green variety. If you want to participate in the last Garland Farmer's Market for this year, Contact Kirk Lovett and reserve a space for the third Saturday in September. Two weeks ago today on Friday, August 2, inhabitants of The Garden of Eden, a small Intentional Community based on Sustainability, were awakened by a SWAT raid conducted by the City of Arlington for suspicion of being a full fledged marijuana growth and trafficking operation. Ultimately only a single arrest was made based on unrelated outstanding traffic violations, a handful of citations were given for city code violations, and zero drug related violations were found. The raid on the Garden of Eden farm appears to be the latest example of police departments using SWAT teams and paramilitary tactics to enforce less serious crimes. For example, other SWAT team raids have been conducted on food co-ops and Amish farms suspected of selling unpasteurized milk products. What can people do? First of all, they can start standing up to these bullies by attending city council meetings, and demanding that these activities against local citizens end. Just because the leadership of a community does not agree with the lifestyle of a group of its citizens, does not give them the right to send in strom troopers to tear up their homes and property. Local is where all power begins--with you and your community. It is absurd that in the city of Dallas we have over 300,000 children living below the level of poverty--enough to fill the Cowboy stadium more than twice--and local governments in the area are spending hundreds of thousands of dollars on SWAT teams to harass local citizens and drones to spy on them. Absolutely absurd. These people need a lesson in how to set priorities. 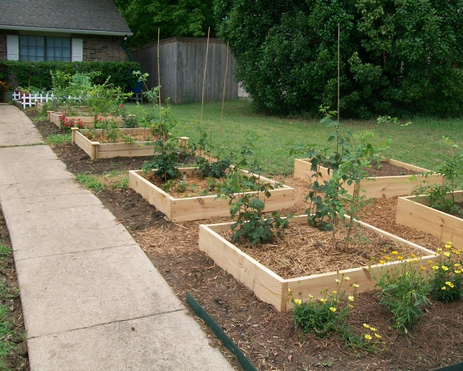 This blog is centered around the development of my own urban gardens and reports on my successes and failures: Urban Garden 1 is located in my front yard where I am in the process of tearing out my lawn and creating an edible woodland forest in its place. Urban Garden 2 is the strip of land beside my driveway in back. 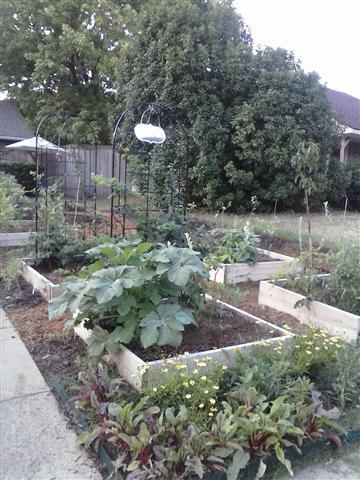 This garden includes mostly annual vegetables. Urban Garden 3 is my back yard which is filled with mature trees. Unfortunately, none of them bear edible fruit. Eventually this space will evolve into another woodland edible forest with shade tolerent perennials such as miner's lettuce in this garden. Fritz Haeg's assessment of the front lawn is accurate as I have written in a previous post. It is a very iconic and loaded space. Removing and replacing it with something else, questions all of the values implicit in the lawn and what it symbolizes. According to Haeg, the easiest first step for the urban citizen who wants to make a visible impact on their city is to replace their front lawn with edible plants. It is the leading wedge into more complex and ambitious civic activity. To put it more locally, my Urban Garden 1 is a piece of land that will not only help to feed me; it is also a highly visible political statement 24/7 expressing my disapproval of our current unsustainable corporate managed mono-crop food system here in the USA. Our oil-based/dependent agricultural system would be unsustainable even if oil were priced at a dollar a barrel instead of a hundred dollars a barrel. Many are beginning to note that our current corporate run mono-crop agricultural system is lumbering like a dysfunctional beast toward the trashcan of failure stubbornly ignoring all the basic lessons of nature, such as diversity, as it slouches along leaving a trail of pollution in its wake. There are over 20,000 species of edible plants known in the world; yet fewer than 20 species now provide 90% of our food. Limiting our food sources increases our vulnerability to famines. When entire crops fail because of unfavorable conditions relevant to that one plant species (or when commodity traders manipulate the markets and price people out of food in order to wring profits out of the market for the few), millions of human beings starve to death. Thus I regard our current agricultural system not only as dangerously risky and inefficient, but also as immoral. Compare our current agricultural system nature's agricultural system. A cultivated crop such as wheat has all its roots at the same depth across the same horizontal band of soil of the entire field. Thus, there is intense competition among the plants for the same nutrients. If you could see a cross section of the soil beneath a row of wheat, you would see the roots all reaching at approximately the same level in the soil competing for all the nutrients at that level and also using up all the nutrients at that level of the soil resulting in compacted earth. If you could see a cross section of the soil in an edible woodland forest, you would see roots at varying depths–some near the surface and others reaching even several yards down into the soil for their nutrients. Thus a wide range of plants can grow side by side occupying its own space. When leaves fall they provide nutrients and substance to the soil--not man-made chemical fertilizers. Unlike the woodland edible garden which consists of perennials, the plants in our current corporate industrialized system are annuals that must be planted each year. Annuals require cultivation of the ground every year, sowing the seeds, controlling the weeds, adding fertilizers and attempting to controls pests and diseases. Continued intensive cultivation destroys the organic matter in soil and increases the risk of erosion from wind and rain. With our current industrialized system, we are trapped in a method of growing with lower yields for far more input and expense. The absurdity of our system is reflected in the fact that we expend more energy in producing our food than the yields of energy available from the food itself once it is harvested. Our current industrialized agricultural system is another version of the old folk tale, "The Emperor's New Clothes." We can't afford to wait for the people running to show to realize how their methods of tailoring our agricultural system are exposing us to disaster. If we wait for them to act, it will be too late. We will go down with them. This is why I encourage all citizens to become urban farmers and start planting edible plants now. Together we can replace our current agricultural system with one that is locally based and does supply the needed and affordable nutrition that we need. Wheat and nuts are somewhat nutritionally similar. Consider the yields and the efforts to obtain these yields from two acres of land: one planted with nut trees such as various species of pecan trees and almond trees and the other acre planted in wheat. The life span for a pecan tree is 40 years. The almond tree has a life span of 20-25 years. The life span of wheat is one growing season. It must be replanted year after year. And, the more the acre is planted with wheat, the more the organic quality of the soil is destroyed and the more dependent it becomes on artificial life support from pesticides and chemical fertilizers. Furthermore, as a mono-crop, the wheat field is far more susceptible to a wipeout than the diversified pecan and almond grove. Also in terms of yield, the nut tree grove is far more productive than the acre of wheat. If other woodland perennials such as miner’s lettuce, are planted in the grove, food yields can even be added to that of the primary crop of nuts. Our current industrialized methods of agriculture make absolutely no sense–except to the owners and investors in the wheat and corn markets, the pesticide business and the chemical fertilizer business. These people are not feeding the hungry as they claim. Instead, they are destroying our planet’s natural abilities to provide us with food for the sake of their own personal profit. Iflizwerequeen, I would be the best Urban Gardener in the Universe. However, as luck would have it, I am not the queen (thus the key word "if") and I am so far down the line of the "best urban gardeners in the universe" that I'm not even a blip on that exclusive radar. However, I like to believe that what I lack in horticultural knowledge, I more than compensate for with my unbridled energy and enthusiasm for urban farming. If I were queen, I would degree that all citizens of the USA are required to grow at least one edible plant a year. Inspired in great part by the adventures of Eric Toensmeier who wrote "Paradise Lot", I (a totally inexperienced gardener) began on June 12, 2013 to tear our my front lawn and replace it with what I hope in about three years will be a self-sustaining edible woodland garden. Thus far, in what was once a totally useless expanse of lawn, I currently have 17 blueberry bushes, 2 blackberry bushes, many strawberry plants, two almond trees, two peach trees, two pomegranite trees, and numerous other perennials--and I've hardly begun. Tearing up one's front lawn is an exhilarating as well as socially stimulating adventure. Over the past two months, 42 people driving past my home have stopped to chat with me. I have lived in this home for 8 years and never once until now have passerbys stopped to chat with me when I'm out in the front yard. LESSON LEARNED: If you are lonely, start tearing out your front lawn. 2. You can’t eat your lawn. Just try putting grass clippings in your family’s salad and see how far that gets you. ". . . The front lawn is wrapped up in our ideas of the American dream. It’s a very iconic and loaded space. When you remove it and replace it with something else, you are questioning all of the values implicit in the lawn and what it stands for. It is significant to me not just because it’s a private space that’s very public – so visible in our cities and such an obvious opportunity to reconsider – but also because of what it symbolizes. The easiest first step for the urban citizen who wants to make a visible impact on their city is to go out that front door and get their hands in the dirt. It is the leading wedge into more complex and ambitious civic activity." I've dubbed my own front lawn: "Sir Solomon Grundy". 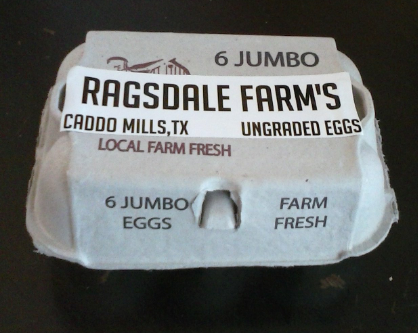 Welcome to my world of Urban Farming here in the Dallas Metroplex! Above is a photo I took July 30, 2013 of the first cantaloupe I ever grew. 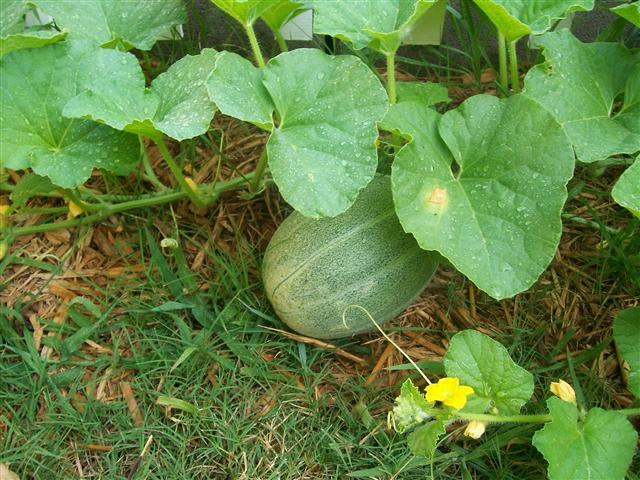 On July 7 the cantaloupe was growing out of a pot in my front yard and looked like this photo shown below. Only 23 days later and the beauty shown above is displayed in my kitchen. It’s the largest non-human thing I’ve ever grown and I forgot to weigh it! What kind of a parent am I!!!!!! I was so focused on tasting it that I lost track of much else. But I will say that it was slightly larger than most cantaloupes purchased at the supermarket and a lot more beautiful. 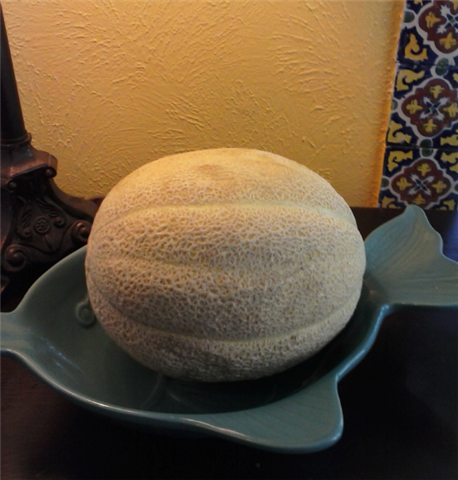 Nothing can compare to a cantaloupe still warm from the sun and just picked from your own garden. It was a delicious nutty melon flavor. The perfect texture: Firm but not crunchy firm like so many melons purchased in the supermarket. Its skin had a golden glow, much like the color of its inside–not green like the ones in the store. It was wonderful and yes, I have not only saved the seeds, I planted one of them and a healthy vine is now growing in one of my gardens. With a little bit of Luck I'll have more cantaloupes before the first frost. In addition, the mother vine that produced my first beauty has two promising female blossoms that are swelling so I may have more great cantaloupes long before a frost as well. Below is the Queen cantaloupe on July 7, 2013. 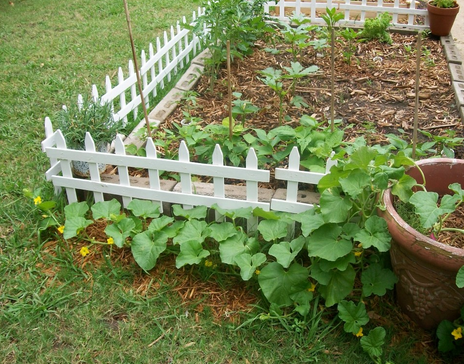 Below is the vine and pot from whence grew the queen cantaloupe.